Home composting is a great way to not only be environmentally friendly, but to reap lots of other benefits as well. Statistically, around 60% of household rubbish can be composted in the UK, which is a massive amount. Best of all, composting is easy and requires little initial investment. We're here to tell you all you need to know to get started! Just in case you don't know, we should first tell you what exactly composting is. Some kinds of waste, particularly organic or food wastes, break down naturally over time to form what we call compost, which is food for soil that's rich in nutrients. This all happens by itself, but the idea of home composting is to speed the process up a little bit, resulting in less rubbish and more delicious food (for your plants, not for you!). Composting is, of course, great for the environment, but it also has a couple of other benefits. Firstly, it saves you money, since if you've got a garden you won't need to pay for expensive fertilisers to get your plants looking great. Plus, if you're a “big rubbish” family, you'll cut down on your amount of waste and won't need to pay for bigger bins or extra pick ups. 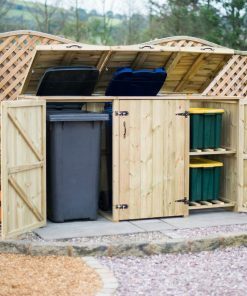 And when it comes to those bins, keeping organic materials out and putting them into compost instead will mean less rubbish and also less smell (which has to be a good thing). Starting out is easy. Firstly, decide where you want to put your compost bin. Most people put theirs at the end of the garden, but the choice is up to you. You don't even need a garden to compost, there are in-home composters available that go on your balcony or in your kitchen, and you can then give the compost to your house plants or to a friend. 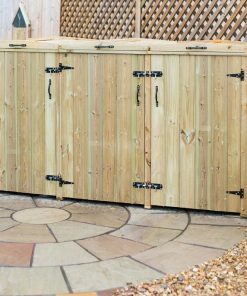 Once you've decided what kind of space you have to spare, you'll need to go and make your initial investment, a compost bin. Now, you can make your own compost bin, and many people do, but you'll probably find if you're starting out that buying a plastic home compost bin is easier and less work. These bins have a funnel at the top to put in waste, and a small door at the bottom to take out compost when it's ready. We promise that this will be less work than constantly turning and watering a pile of compost out at the bottom of your garden without a bin, plus it means that your compost doesn't need to be covered with something else. Think of a bin as the microwave of composting, it just makes life easier! Pro Tip: If you're going to be keeping your compost bin in your home, or on a hard surface such as paving stones (rather than on bare ground or grass), you will need to add some worms to start off with. Worms are essential to the compost process and if your bin is on grass or bare ground they'll find their way there themselves. Otherwise, you might need to go dig a few up from a patch of waste ground and add them in (you can also buy worms from some pet shops and fishing supply stores or online). Once you've got your bin up, you'll need to put stuff in it! For good compost you'll need both “browns” and “greens.” Greens are easy, this is anything plant related. So your vegetable peelings or apple cores, any weeds or plants taken out of the garden, tea bags or leaves you have raked or collected with a leaf blower, even coffee filters and coffee grounds. Greens rot quickly and are full of nitrogen to promote healthy soil. Browns are a little more complicated. These can be thin cardboard (like toilet roll tubes or cereal packets), paper, tissue paper, brown leaves in autumn, branches or wood from the garden, animal bedding, crushed egg shells, what's inside your vacuum bag, hair and fur, things that are generally brown! Browns have lots of carbon, which will help the decomposition process. What doesn't go in? Careful not to put in cat litter or animal faeces, baby nappies, cooked food, dairy products, fish or meat, plastic, glass or metal, and no glossy paper or foil! Maintenance for compost is pretty easy, and you really only need to do two things. The first of these is to keep it aerated, since the decomposition process needs air! But this is simple. You can either use a garden fork to “turn over” the compost once every couple of weeks, or even easier, use a thick stick (like a broom handles) to poke holes into the compost once a week. Secondly, compost does need to be moist, but not wet! Make sure you fasten the lid after use to stop it getting wet from rain. And in the summer check it periodically to make sure that it's not dry, if it doesn't feel moist you can add a little water from your garden hose. And that's it! Depending on what you put in you should have compost ready to use in from nine to twelve months, after that it will produce constantly. You can use compost to make potting soil for your plants, or mix it with top soil in your garden. If you have compost that has more “browns” in it and is woody in texture, it's perfect for plant mulch at the base of trees and bushes (especially roses!). If you're just getting started, here are a few of our best home composting tips to help you on your way! Place your bin carefully, it should be on a flat surface to stop it tipping over in the wind! It's best to keep a small container in your kitchen for compost and take it down to the compost bin every few days, this makes the choice to compost easier so family members are more likely to separate their rubbish! Rats love compost, but people hate rats. If you want to avoid rats in your compost make sure that your bin is as sealed as possible, with the doors and covers closed. If your model has large ventilation holes consider putting chicken wire over them so rats can't get in! Keep a good balance of browns and greens in your bin to prevent all problems, including compost that's too dry or too wet, and bad smells. If you find that you produce more of one than the other, consider asking your neighbours to pitch in! And that's all you need to know. Composting really is super easy, and it doesn't hurt that you'll save yourself some money too!